Senator Bernie Sanders finally endorsed Hillary Clinton for the Democratic presidential nomination. Looking back on his campaign, he lost with the group he intended to represent: disenfranchised and minority voters, including Latinos and African Americans, according to a Univision analysis of the 500 poorest counties in the United States. Among Hispanic voters, Hillary Clinton was the clear favorite during the primaries, winning 10 of 11 states where Hispanics make up 15 percent or more of the population. 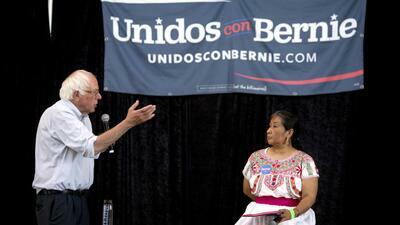 Sanders won only in Colorado, which has the eighth largest Hispanic population in the country. With around 27.3 million eligible voters, the Hispanic electorate is key for any candidate who wants to win the White House. Sanders, the 74-year-old grandfather of seven, has painted himself as a candidate for the voiceless, vowing to fight on the front lines for the vulnerable – the poor, unemployed, African-Americans, and the uneducated – in a drive to ignite a political revolution. He called for increasing the federal minimum wage, reducing income and wealth inequality and creating better paying jobs. However, Sanders succeeded in counties with higher numbers of educated and employed voters and a higher median family income. Hillary Clinton – branded by Sanders as the “establishment” candidate – carried the vote in heavily poor, African-American and unemployed communities. Analysis by Univision's Data team showed that the 500 poorest counties in the United States voted overwhelmingly for Clinton. The former first lady and secretary of state won 70.89 percent of the vote in those counties and Sanders won 24.4 percent – a 45-point gap. Those numbers contrast with the results from the 500 richest counties, where Clinton also won the vote but by a much smaller margin, 56.08 percent against 41.65 percent. Susan MacManus, political analyst and professor of political science at the University of South Florida, says the outcomes for the Sanders “revolution” are likely the result of his popularity among young voters. “Millennials have much higher education rates than older voters in general, and progressives themselves tend to be a bit younger,” she said, adding that higher levels of education also mean Sanders supporters are more likely to live in areas with low unemployment. Univision Data’s analysis revealed that support for Sanders had an inverse relation with unemployment, meaning he fared better in counties with lower levels of unemployment and not so well in counties with higher levels. The Vermont senator also did better in counties with higher percentages of people with university degrees. The data also showed Sanders fared better in states that hold caucuses instead of primaries. He won 12 of the 14 state caucuses held by the Democratic party – not including overseas territories – and lost only the first two in Iowa and Nevada, where the Clinton campaign invested significant resources. Ironically, that means that Sanders did poorly in the broad popular votes – the primaries – and was more successful in the caucuses, where participation is limited and requires voters to spend hours talking about political preferences. Caucuses tend to leave out low-income people who don't have a lot of time to devote to politics. The Sanders camp has a different explanation. Ben Tulchin, a Democratic strategist and pollster for the senator's campaign, said the candidate did well among voters with low and medium income – between $40,000 and $80,000 per year. Perhaps the biggest failure of the Sanders campaign was its poor showing among African-Americans. Despite campaigning on issues such as putting an end to police abuses and justice system reforms, the senator lost ground in counties with large populations of African-Americans. In the seven states and the District of Colombia where African-Americans make up more than 25 percent of the population, Clinton won at least 63 percent of the votes in the primaries and as high as 82.6 percent in Mississippi. Exit polls after the New York primaries indicated 75 percent of black voters favored Clinton and 25 percent backed Sanders. She added that Clinton’s identification with the policies of President Barack Obama further consolidated her support among African-Americans. Kyle Kondik, a campaign and election analyst at the University of Virginia Center for Politics, said the results of the Univision analysis may be a function of race more than anything else. “Unfortunately, generally speaking, white Americans are economically better off than non-white Americans,” he said. “What is interesting is that you had Sanders, who’s a candidate defined by his progressive socialist stances on issues, and yet the people who economically are doing poorer and tend to be more non-white are the ones who back Clinton,” Kondik said. In the case of Hispanic voters, there was no clear difference between Sanders and Clinton in counties with the largest Hispanic populations – a fact that MacManus chalked up to the fractured nature of the Latino voter bloc. The heated fervor of Sanders' loyal followers no doubt contrasts with the cold numbers he racked up. Website TheGreenpapers.com estimated Sanders won only 42.75 percent of the popular vote, compared to 55.58 percent for Clinton. The more black, Latino or poor the county or state, the fewer Sanders victories. Although the senator's supporters say they are enthusiastic about the future, the growing diversity of U.S. voters indicates that his political revolution is unlikely to happen with white majority support alone. In any case, Sanders had a significant impact on Democratic primaries and caucuses that were initially viewed as little more than a coronation for Hillary Clinton. Perhaps his revolution was not felt in the poorer corners of the country. But it clearly resonated in the hallways of the Clinton campaign headquarters in Brooklyn, pushing the former first lady and her message to the left.